Yeah baby. A new USAF fighter known as the F-22 Raptor scored 144 "kills" against front line Air Force, Navy, and Marine fighters while sustaining zero losses during the recent Northern Edge exercise in Alaska. Loitering above 65,000—at least 15,000 feet higher than F-15s and F/A-18s—the jet's new radar can see more than twice as far as it's adversaries. Even more impressive, the high resolution radar allowed positive identification of "enemy" aircraft well beyond visual range. 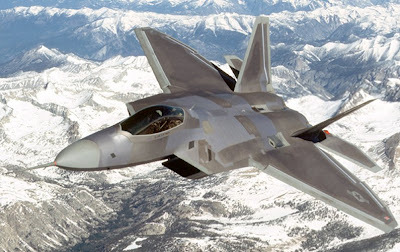 Even after expending all its weapons, the F-22 would stick around, use it's supersonic cruise capability to range across hundreds of miles, and provide targets and IDs to conventional "friendly" fighters. The Raptor is designed to work in a "network centric" environment to share data with other assets in the area. An F-22 pilot, for example, can simply click on the icon of an armed unmanned aerial vehicle (UAV) and drag it over an enemy air defense emitter. The UAV then flies over and jams the radar or bombs it. According to one F-22 pilot, "The bad guys didn't want to lose, and they were wily. We had guys running in at 500 feet off the deck and others at 45,000-50,000 doing Mach 1.6, trying to shoot me before I knew they were there. They would mass their forces and try to win by sheer numbers. None of it worked."